This mural is a visual recounting of the 90th Division's history from World War I to the present. It depicts fifteen life-sized soldiers from a doughboy to modern day reserve soldier currently serving in Afghanistan. 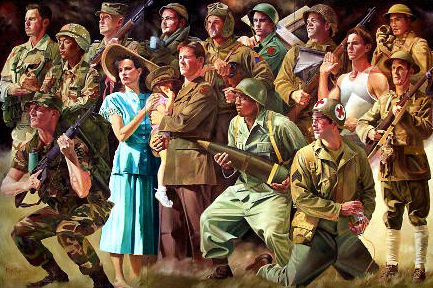 The actual mural measures 12 feet by 8 feet and is located in the main lobby of the 90th Regional Support Command at Camp Pike, North Little Rock, Arkansas. CLICK ON INDIVIDUAL FACES FOR A DETAILED IMAGE.